The new Mercedes-AMG G 63 is now on sale, with prices starting from £143,305. A special ‘Edition 1’ model is also available from £164,495. 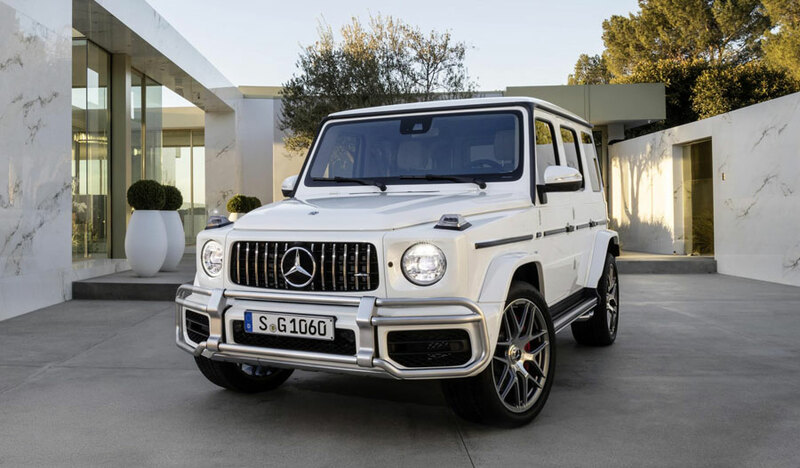 The G 63 features AMG’s hand-built 4.0-litre ‘hot V’ V8 petrol engine which produces 585 hp and 850 Nm of torque. It has an electronically limited top speed of 137 mph – top speed is increased to 149 mph with optional AMG Driver’s package – and can sprint from 0 to 62 mph in just 4.5 seconds. It delivers 21.4 mpg on the combined cycle and emits 299 g/km of CO2. The AMG Speedshift Plus 9G-Tronic transmission comes as standard, making for shorter shift times. AMG RIDE CONTROL suspension is also standard and features a fully automatic, electronically controlled system which adjusts the damping at each wheel to the current road surface – this ultimately improves driving safety and ride comfort. Standard equipment includes a 12.3-inch digital cockpit display and 12.3-inch infotainment display – creating a widescreen cockpit; 64-colour ambient lighting; Thermatronic three-zone automatic climate control; Burmester surround sound system; Parktronic with 360°camera; Multibeam LED headlights with Adaptive Highbeam Assist Plus; electric sunroof; AMG sports exhaust system; 20-inch alloy wheels finished in titanium grey; AMG Ride Control suspension; AMG high-performance brakes; permanant four-wheel drive with three 100% locking differentials; and smartphone integration (Apple CarPlay and Android Auto). The Edition 1 adds AMG Night package; 22-inch alloy wheels finished in matt black with red pepper rims; Winter package (including auxiliary heater and heated windscreen); AMG Exclusive nappa leather upholstery in black with red inserts and contrast stitching; Active Multicontour Seat package; and ‘Edition 1’ badging. The Driving Assistance package is standard on both models and features Blind Spot Assist and Active Distance Assist Distronic. The AMG Night package (standard on Edition 1) costs £2,700 and includes 21-inch alloy wheels (22-inch alloys available as a cost option) and exterior details finished in obsidian black. The Winter package costs £1,750 and adds a heated windscreen and an auxiliary heater (including remote control). The Winter package is standard on the Edition 1. For more information on the new G-Class, please visit www.mercedes-benz.co.uk.